I don't really like pain or discomfort. 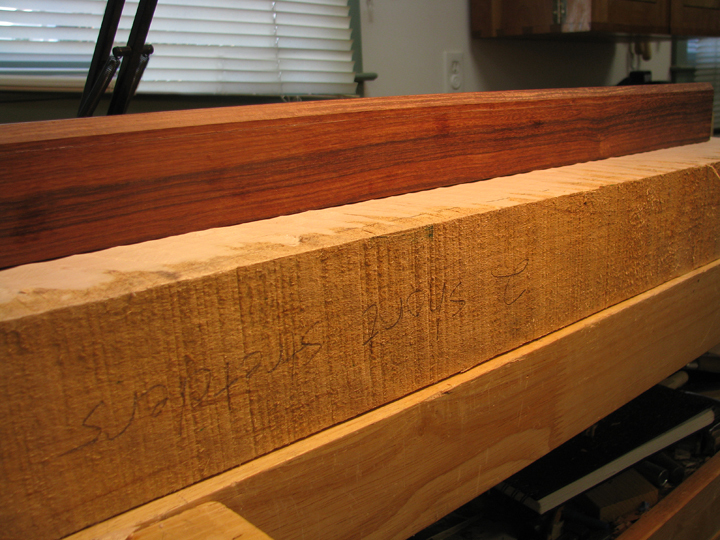 But when you need to mill rough cut boards—none of which are flat enough to run through a power planer and are too wide for a power jointer—it's time to break out the handplanes and play some workout music. Here is one method for flattening boards. Other woodworkers use different approaches. Scalloped surface left by scrub plane. First, remove high spots. 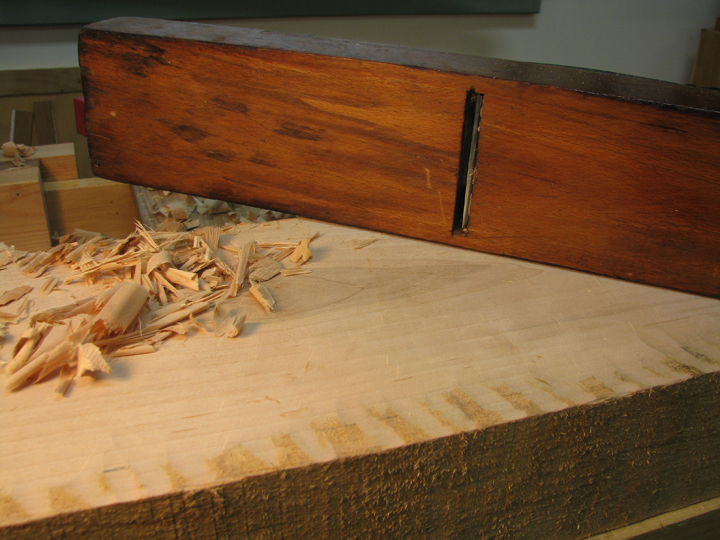 You can do this by traversing your board (planing across the grain) with a jack/fore or scrub plane—or any plane that can hog off thick chunks of wood—and checking your progress across the grain with winding sticks and with the grain with a long straightedge. 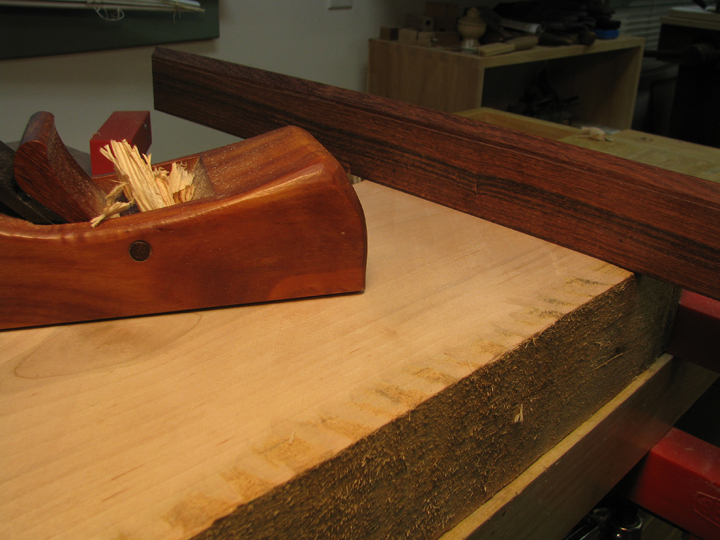 After that, you can switch to a jointer/try plane—or any plane with a slight camber on the iron and somewhat large mouth opening. This flattens the scalloped channels left by the previous plane. 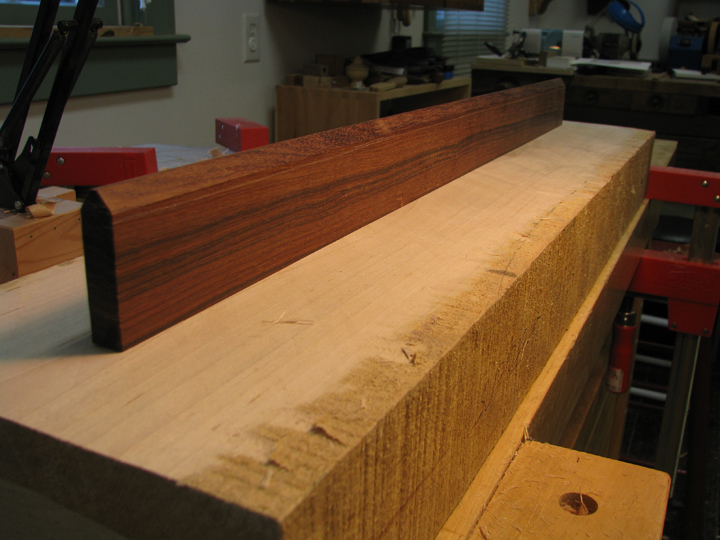 Finally, a plane with a fine-set mouth and straight iron achieves a finished surface. Transitional plane with slight camber. Problem is, I do not have a jointer plane that can be used for step two. 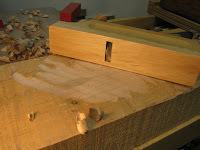 The wooden one that I made is set up for fine shavings along the edge of a board. I don't have time to make a new one, nor do I wish to part with more money having spent a chunk of change on lumber for my workbench. This dilemma sent me to the basement (my former shop) in search of...anything. What I found was an old transitional plane (the love-child of a wooden plane and a metal plane) that was given to me years ago, and is about as attractive as Billy Ray Cyrus' Kentucky waterfall. Chuck, my beefy short plane. We shall call him Ned. Ned needed a thorough scrubbing behind the ears to get him in working condition. And his iron needed to be re-ground with a slight camber and steeper bevel. Heavy and awkward and difficult to set up as he his, he performed pretty darn well. Well enough to be followed by the much easier to use and lighter weight Chuck. of the board with a straightedge.